One of my fond memories growing up is of all my cousins gathering around a box of delicious hand crafted bread from my Aunt and Uncle's bakery. We would all pick through and bring home a few of our favorites. Sometimes my Aunt would even set aside some focaccia for my sister, or olive bread for my Father (their favorites). My Aunt and Uncle own a Traditional Italian Bakery, La Panciata, in central Vermont. Having such delicious and high quality bread was a treat for us at the time. For years, I played with the idea of bringing a bakery like my Uncle's to Keene. I loved to cook and bake, and I had seen businesses grow around me my whole life. My Uncle's bakery was a thriving business with a wonderful product. My Father and Mother had built a great company, as well. I grew up working in their business, and their employees were like a second family to me. When I went to Vermont to apprentice with my Uncle, he was helpful and patient in teaching me the process. Baking is about the techniques and process that you use to create your product. My Uncle had adapted his different processes for creating a high quality product. We still use many of the techniques I learned during that time with my uncle. The longer fermentation period coaxes more flavor out of the dough, and gently shaping the dough achieves the desired crumb and texture. We opened our doors in April of 2011 and originally sold only to Farmers Markets. 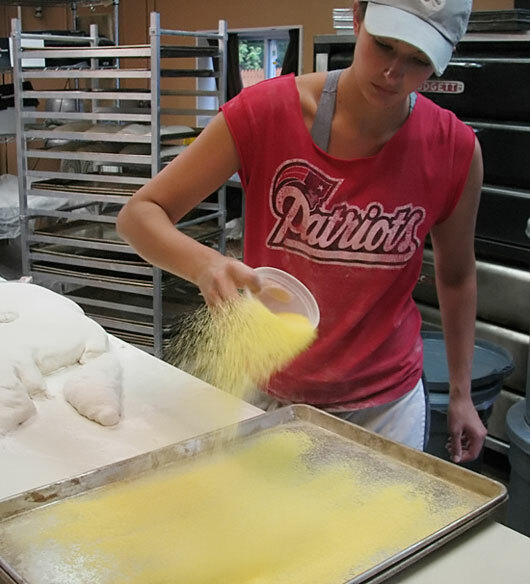 We slowly grew as different restaurants in town put their trust in us to provide their breads, as well as local stores. We grew quite quickly with all of the overwhelming support of our community. In the first three years we had three different locations, as we rapidly out grew each space. I am very thankful to have had so much support over the years as The Bread Shed has grown. We have a great team that continues to grow, we have a great community, and I have great support from my family and friends around me. We are so happy to be able to do something that we are so passionate about. We are committed to continuing to use real wholesome ingredients to bake Simply Good Bread to share with you and your family.